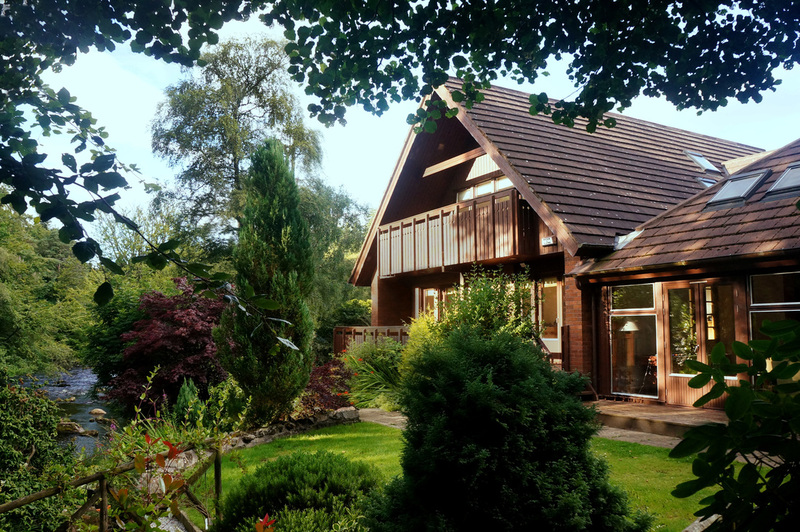 Situated on the banks of the River Feugh, just outside the picturesque town of Banchory, Otterstone is a luxury Bed and Breakfast located in an ideal position to explore Royal Deeside. Situated on the banks of the River Feugh, one of our first visitors exclaimed "living here must be like being on holiday everyday!" A warm welcome awaits you at Otterstone for your stay on Royal Deeside. Our exclusive super king size bedroom with en-suite bathroom features a private balcony overlooking the River Feugh. Enjoy the peace and tranquillity of the home while only being a 15 minute walk from Banchory town centre where you will find shops, tea rooms and restaurants. You can see the salmon jumping at the Falls of Feugh which is just 200 yards down the lane. As they journey upstream they can sometimes be seen basking on the sand beds from the bedroom balcony. Whether you are here to enjoy the beauty of Balmoral, Crathes and Drum Castles or have a more energetic stay with pursuits such as cycling, hill walking, fishing and even skiing, Banchory is the perfect place to base yourself on Royal Deeside. "Not enough room in the visitor book to express our gratitude"
"Very simply - Amazing, fantastic - a very special place"
"Location, location, location! Otterstone provides the 'wow' factor!"